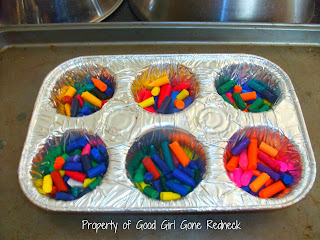 Good Girl Gone Redneck: Crayon-fest for Muffin Tin Monday! Crayon-fest for Muffin Tin Monday! I've always wanted to do these, and Monday was the perfect day to give it a go. The kiddo was fascinated, although honestly frustrated with peeling the crayons (I won't talk about the painful smidges underneath my thumbnails - ow!) - which is hilarious to me as she used to do that all the time when she was little. But that's a whole nother ball o' wax. *Did you like that? A little crayon humor? No? Me, neither. We started off with the batch of broken crayons I've been collecting for a while. It's a much smaller batch than I thought we had. And because of that I decided to just do a 6-pack of crayons. Smaller, less, simpler and less mess! After peeling and dropping into the muffin tin, we popped them into the oven at 250* and set the timer for about 12 minutes. I checked them a few times and we definitely had a few stragglers that wouldn't melt. I used a plastic spoon to disperse (all clinical here - right?) the extra crayons throughout and was honestly thinking we'd be disappointed with the colors. I don't have a shot of them in their liquid-state, but they looked all greenish-blueish and I was a little worried. After taking them out of the oven (a few extra minutes of checking and swirling) I let them cool for a bit in the microwave. No special reason they're in the micro, they're just up there to be away from tiny hands before they're ready. 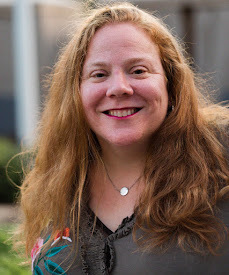 Once they seemed to start to solidify, I moved them to the freezer, set the timer for 15 minutes (probably not necessary but I wanted to give her a timeframe) and we took them out. Once we flipped them over they looked so pretty! She loved them, was all excited that we created them, and was ready to draw! 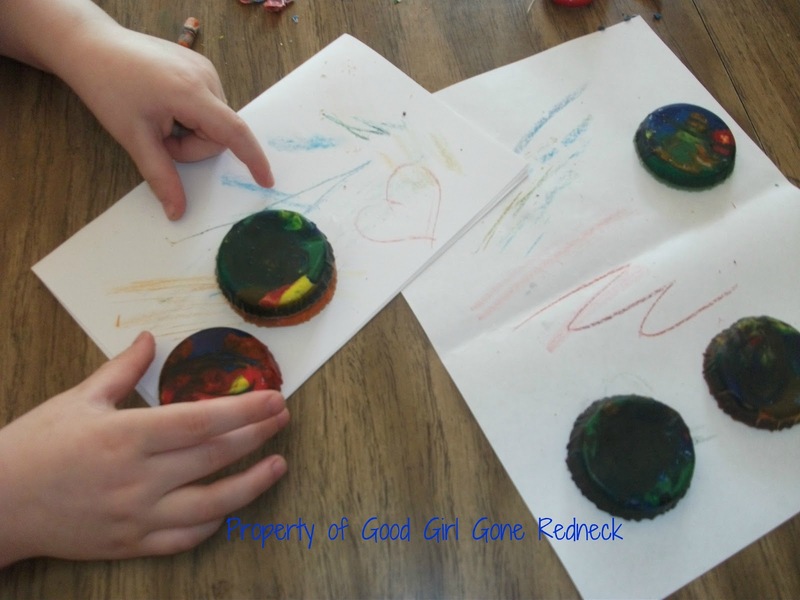 So if you're looking for an easy and super simple craft idea for your kiddos, this is definitely the one for you. Have fun. Your kids definitely will! I'm linking up this week with Muffin Tin Monday. It's been a while since I have and I know this isn't a meal, but it's still Muffin Tin Fun and kind of goes with the Spring theme for the week. 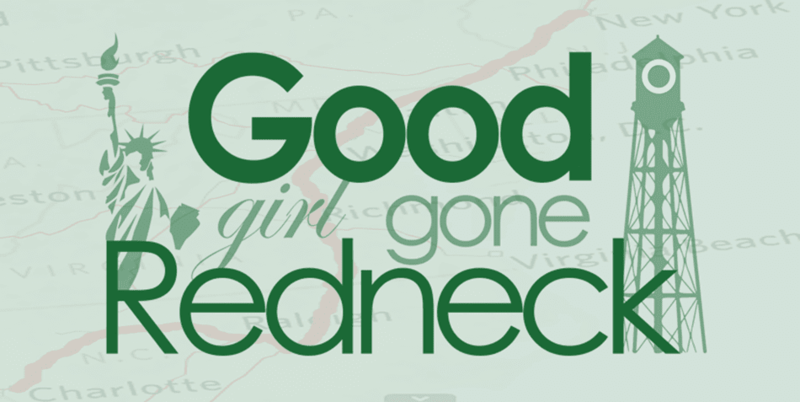 For more info on Michelle and her cool weekly meme, click the button below and enjoy! These are cute! I've been wanting to do this - someday I'll get around to it! I definitely want to do this and you made it sound oh so easy! Can't wait- we are still in the, "No tasting crayons! If you put a crayon in your mouth we won't be coloring anymore today!" phase. This look great! I have so many broken crayon I need to recycle. Looks like they turned out really well. 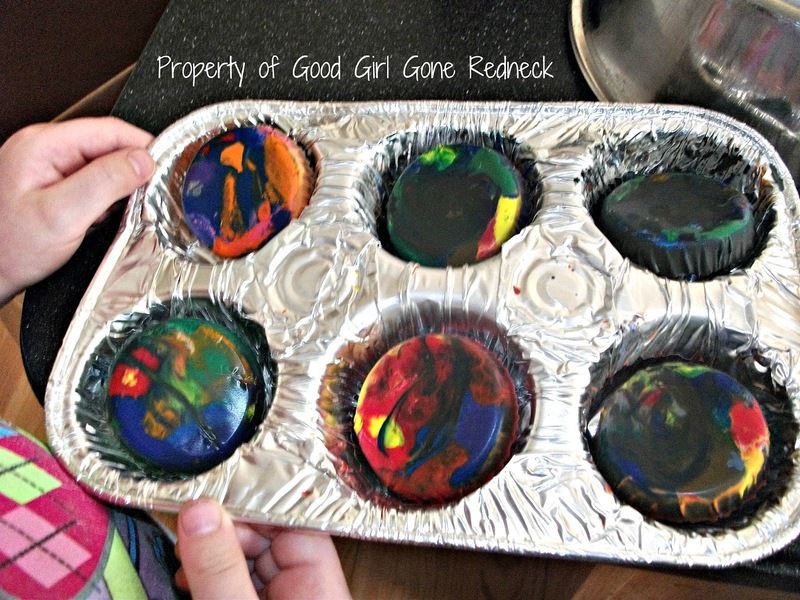 We did this last week using an ice cube tray, but I did the lazy version and used the microwave!